Lionsgate screened the first-ever trailer for Hunger Games: Mockingjay for fans from their wacky Comic-Con Capitol lounge (which also has a makeshift Peeta bakery on site). And this is what we saw! The teaser starts zooming over (what I'm assuming is) District 13. The industrial wasteland is made up of what appear to be abandoned factories. The machines are stopped, there are no citizens outside and the smoke stacks are silent. The hovercraft that rescued up Katniss from the games in Catching Fire lands. Plutarch Heavensbee (Philip Seymour Hoffman), President Coin (Julianne Moore) and Beetee (Jeffrey Wright) are sitting at a table. Plutarch looks at Coin and states, "Listen to me. No one else can do this but her." Coin responds. "She won't be able to handle it. The games destroyed her." Cut to a makeshift hospital filled with injured members of the rebellion. 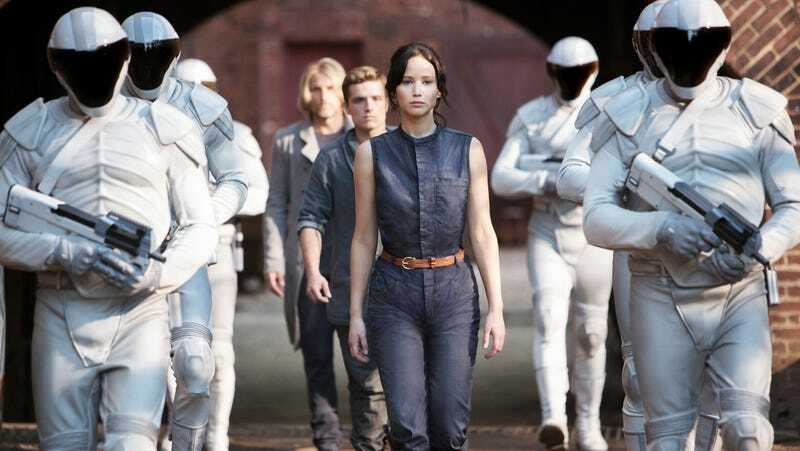 Katniss is walking through the injured; they look really, really young, and badly prepared for what's ahead. Gale's face appears, and he's in tactical gear and appears to be sad. That's all from Gale. Plutarch responds to Coin, "We need to unite these people out there. She's the face of this rebellion. They'll follow her." Cut to the Capitol. President Snow is standing in front of two of his minions and bellows, "Any association with the Mockingjay symbol is forbidden." A Peacekeeper's helmet appears, and in his reflection you can tell he's shooting down citizens (presumably they have something to do with the Mockingjay). The trailer cuts to the war. A band of rebels scale the trees with Twilight-vampire-speed while an army of Peacekeepers shoots the wood with their blaster guns. Another cut to a crowd of citizens running down what appears to be the safety area beneath District 13 as they're attacked by Capitol. A small boy who was standing among the wounded in the crappy hospital asks, "Are you fighting, Katniss? Are you here to fight with us?" She responds, " I am. I will." And no lie, Jennifer Lawrence does kind of does look severely damaged from the latest round of games and death and madness. Poor thing. But she still has her arrows, which will come in handy during the war (okay, not really, but hey — symbolism).